Eric and I went to visit our two mares who are in training at the moment. We knew that Anna had been driven before, but we have no idea how long ago it was. As Jane had never been driven and only ridden a handful of times, Eric decided that they would go to a local trainer to have the basics put on them. The sun came out for about 5 minutes. With only about 9 days of training, they are looking pretty good and we are already excited about getting them back home! We fed this way when I was a kid and the herd was large; my Uncle raised Big Blondes he called them, Belgians of course, and he was pretty well known for great horses. Having only a few cattle now, they are fed from a round bale feeder. That bale unspooler sure is a nifty piece of kit you've got there which would have come in handy in the old days. We had only a square baler back then, so it was a big job loading onto the stoneboat 3x a day, then us kids would be pulling apart the bales and throwing the flakes off the back. It did take longer, but we got the job done and, even on the coldest, most miserable days in the Alberta foothills, riding behind the team made the task quite enjoyable. I am passionate about our ranch, animals, the wildlife and nature around us. I feel strongly that we can co-exist with our wild neighbors. It is possible, with management, to live with predators. I enjoy sharing my stories and photo's of our life on this sheep and cattle ranch in Northern Alberta, Canada. 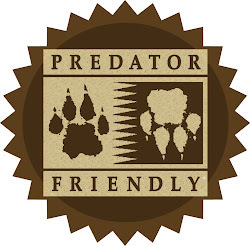 Our ranch is the first in Canada to be certified Predator Friendly and Wildlife Friendly. 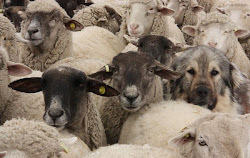 Wolf collars, dangles and yokes. The dilemma of “hands on or hands off” raising. Need to find something in an old blog? This may help..
© Louise Liebenberg. Awesome Inc. theme. Powered by Blogger.